Many serious challenges face Lake Winnipesuakee, but almost all of them are watershed-wide issues. The New Hampshire Department of Environmental Services (NH DES) coordinates activities associated with the control and management of exotic aquatic plants through their Exotic Species Program and Weed Watchers Program. Their website offers up to date information on current invasive species, frequently asked questions, how to report sitings, control activities, grant programs, as well as pictures of exotic plants to assist you in identifying native from non native vegetation. Emergent and submergent vegetation are sparsely located throughout the lake. Submergent plants include coontail, pondweed, variable milfoil, bladderwort, quillwort, and pipewort. Emergents include yellow and white water lily, pickerelweed, arrowhead and water shield. The greatest concentrations of aquatic plants are found in the northern end of Moultonborough Bay, which is a shallow and embayed area. Other areas where aquatic plants will be found in abundance are in marinas, inlets, and back bay areas. Variable milfoil is the only confirmed exotic or nuisance plant found in Lake Winnipesaukee at this time, first discovered in the lake in 1965. The plant is native to the United States, but not native to New Hampshire. Infestations of the plant can be found in many embayed areas of the lake and small coves such as Smith Cove in Gilford, Back Bay in Wolfeboro, Smalls Cove and Minge Cove in West Alton, etc. You can explore the NH DES online map Exotic Aquatic Plant Sites to learn more. NH LAKES Association offers two grant programs to assist in the control of the spread of milfoil and other invasive species; the Lake Host Program and the Innovative Exotic Weed Control Granting Program. Through the participation of local communities in the program, Lake Hosts can be found conducting courtesy boat inspections to prevent the introduction and spread of invasive species at boat ramps in Gilford, Meredith, Wolfeboro, Tuftonboro, and Alton. If your community would like to participate in the Lake Host Program contact NH LAKES at lakehost@nhlakes.org. The communities of Moultonborough, Tuftonboro, and Wolfeboro have pooled resources to form a partnership to address milfoil infestations within their areas of the lake. With financial assistance through a grant from the Innovative Exotic Weed Control Program administered by NH LAKES, the communities have purchased equipment for the construction of a mechanical weed harvesting machine or DASH (diver assisted suction harvesting) unit. The DASH unit will allow for the non-chemical removal of large amounts of milfoil at a time. It is important to recognize that all of these programs rely on local groups and volunteers to actually do the work of monitoring and managing infestations. Without their commitment and vested interest in protecting our lakes and ponds, these programs would not exist. The NH DES has identified 14 exotic aquatic plants that are prohibited in New Hampshire due to their abilities to choke surface waters, harm native vegetation and wildlife, impact recreation, and lower property values. LEARN MORE about the The Frightful Fourteen (PDF, 584kb). What is phosphorus and why is it an issue? Phosphorus (“P”) is a naturally occurring element and a major nutrient required for biological productivity. It is found in all living plants and animals, including people. It is present in soils, especially topsoil. Although its existence is widespread in nature, it may not be naturally abundant. Phosphorus is usually the limiting nutrient in most New Hampshire freshwater ecosystems and therefore a necessary nutrient for aquatic productivity. Schindler, D.W. 1973. Science, Vol. 184 Experiment demonstrating the vital role of phosphorus in lake productivity. To learn more about phosphorus and the new State Standards and Criteria for phosphorus in New Hampshire water bodies, read the Phosphorus Q&A. 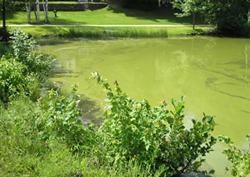 Algal blooms are the result of a very high concentration or density of algae cells. The frequency and occurrence of these blooms are of concern because they can have negative impacts on the aquatic environment, are aesthetically unpleasing, and are of potential health concern. There is a direct relationship between increased levels of phosphorus in the lake and aquatic plant productivity, i.e. algal blooms. In waterbodies used for drinking water supply, such as Lake Waukewan and Paugus Bay, algal blooms can cause physical problems (e.g., clogging screens) or can cause taste and odor problems. Blooms involving toxin-producing species can pose serious threats to animals and humans. Algal bloom locations vary annually and seasonally, often occurring toward the end of summer, when the lake water temperature has risen, and there is abundant sunlight. Recently, reports of cyanobacteria blooms have been cause for concern. Cyanobacteria (often referred to as blue-green algae due to the bluish pigment, phytocyanin, that they contain) are photosynthetic bacteria (able to produce their own food) that have been in existence for over 2.5 billion years, are a natural component of New Hampshire waterbodies, and are important organisms for the health and growth of many plants. Certain cyanobacteria produce toxins that can affect the nervous system, liver, or endocrine system if ingested in large enough quantity. In 1999, Lake Champlain, Vermont, had one of the first reports of a toxic bloom that resulted in the death of a dog. Lake Winnisquam, Lake Waukewan, and Winnipesaukee have all had cyanobacteria bloom occurrences in recent years. Wetlands are natural flood control areas that collect and store stormwater to gradually infiltrate or seep into the ground, resulting in recharge of groundwater. Wetlands improve water quality by trapping sediments carried by stormwater and filtering the pollutants they contain. The nutrients contained in the stormwater are used by wetland plants for growth, which reduces nutrient input to lakes and ponds buffered by wetlands. Wetlands provide wildlife habitat for a wide range of animals and numerous plant species. The richness of plants and animals in wetlands is astounding. The wildlife found in or near wetland habitat in New Hampshire includes migratory waterfowl, such as geese, wading birds, such as Blue Heron, beaver, otter, deer, bear, moose, fox, and turkey. Frogs, salamanders, turtles, and water snakes need to live in or near wet habitat, so wetlands are vital to these species as well. Crayfish, aquatic insect larvae such as dragonfly and mayfly larvae, and fish are dependent upon aquatic habitat and are found in abundance in many wetlands. Standing dead trees provide nesting habitat for woodpeckers, bluebirds, bats, squirrels and deer mice. Plant life in a wetland includes mosses, ferns, lichens, liverworts, grasses, sedges, horsetails, wildflowers, shrubs and trees. New Hampshire is about 6 to 10 percent wetlands, which reflects its glacial history. Approximately 97 percent of those wetlands are nontidal and 3 percent are tidal wetlands. New Hampshire is one of three states that have retained more than 80 percent of its wetlands since 1780 (NH DES) . But when wetlands disappear, so do the benefits we derive from them, including reduction of flood flows, recreation, maintenance of water quality and quantity, erosion control and wildlife habitat. For more information on these wetland issues, read the Winnipesaukee River Watershed Wetland Restoration Strategy Report produced in February 2010 for the New Hampshire Department of Environmental Services by VHB/Vanasse, Hangen, and Brustlin, Inc. in association with the Society for the Protection of New Hampshire Forests and Naturesource Communications. Fragmentation of wildlife habitat becomes increasingly important as development pressures move northward in New Hampshire. In 2005, The NH Fish & Game Department created the state’s first Wildlife Action Plan to provide communities and decision makers with a tool to restore and protect critical habitat and populations of species of conservation and management concern. The Wildlife Action Plan website is a great resource of information on conservation planning tools, interactive maps, habitat description and management, wildlife species profiles, and much much more. Whether trying to accommodate use of snow mobiles, off highway recreational vehicles (OHRVs), mountain bikes, kayaks, boats, etc., public and private resource managers are challenged by the need to balance natural resource protection with public use and enjoyment of those resources. The NH Division of Parks and Recreation manages state properties consisting of campgrounds, beaches, natural areas, historic sites, and recreational trails. Visit NH State Parks for information on the abundant recreational opportunities available in the State and Lakes Region area, as well as information on the laws governing use and protection of these trails, landowner property and the environment. Learn more about Recreation on the Lake. There are several potential health issues associated with poor water quality, not only in Lake Winnipesaukee, but other lakes and ponds in the watershed as well. Beach Closings: Risks from swimming in the lake due to high levels of bacteria, may include skin irritations such as “duck itch” or “swimmer’s itch”, ear infections, or possibly a more severe condition due to cyanotoxins released from blue-green bacteria. Fish Advisories: Due to mercury content, the State of New Hampshire recommends limiting freshwater fish consumption to one meal per month for pregnant women and children under seven years of age, and for all others, four meals per month. Risks due to fish consumption depend on the amount of fish consumed and the levels of mercury contained in the fish. Periodically, the State updates “The Fish Consumption Guidelines” with amounts and species of fish, as well as waterbodies of concern. Drinking Water: Lake Waukewan is the drinking water supply for approximately 45% of the population of the Town of Meredith, and Paugus Bay provides the drinking water for the City of Laconia. Protecting these water sources for safe public consumption from potential contamination due to direct and indirect sources of pollution is important to both communities. Although many island residents may also obtain their water from the lake, it is not recommended that untreated lake water be used for drinking.